Kids leave food they don’t want on a “No Thank You” table so others can pick it up at a community center in the East Texas community of Reklaw. In more than 40 years of working in El Paso ISD’s cafeterias, Olimpia Estrada has seen the amount of wasted food drop dramatically as officials have established programs allowing the redistribution of leftover food. But they still have a long way to go. Estrada and cafeteria managers across the state now have an increased ability to get that leftover food into the hands of students. 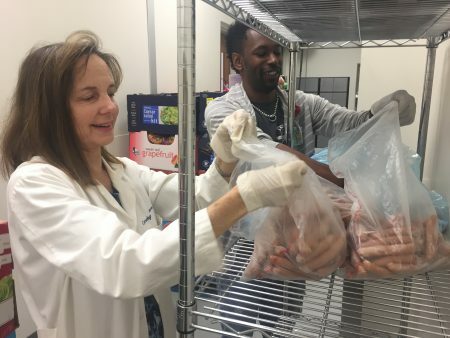 A law passed this spring creates a new pathway for school districts that want to reduce food waste and feed hungry kids throughout the week. Senate Bill 725 — authored by state Sen. Borris Miles, D-Houston, became effective immediately after Gov. Greg Abbott signed the legislation in June. It allows schools to create food pantries on campus where they can store donated food as well as surplus food from the cafeteria. Since 2011, federal law has allowed school districts to donate leftover food to nonprofits free of liability as long as they follow health and safety codes. Of the limited number of school districts taking advantage of the law, many end up donating to food banks or homeless shelters. The San Antonio Democrat toured his district asking teachers and administrators about their biggest concerns for their students. “They were all frustrated with the volume and quality of the food that was thrown away regularly in their cafeteria. They were frustrated by their inability to give the food to those students” who didn’t have food at home, he said. SB 725 creates a loophole that allows schools to keep their leftover packaged food and produce for distribution on campus — by letting them donate the food to themselves. A school can name one of its employees as the designee of a third-party nonprofit, allowing the school to donate and then collect the leftover food. Another part of the bill lets school districts use their campuses to distribute that food. “If they just want to test it out and do bottled water and unopened peel-top cereal and wrapped granola bars, cool,” Bernal said. “If they want to spend money and add refrigerators, that’s also great. 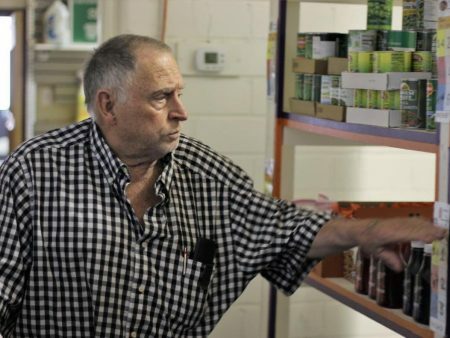 We don’t dictate how they should do it.” Most of the food stored will be unopened, pre-packaged beverages or nonperishable items and whole fruit and vegetables — not warm meals, in order to follow state and local health codes, he said. While SB 725 provides districts with a good option, those districts might not take advantage of it in large numbers, warned national food waste expert John Williamson, who is the founder of Food Rescue, a group advocating against throwing away food. “It’s just that in my experience working with districts, the average district doesn’t want to take on that liability and that amount of work,” he said. He argued local health departments can often stifle school districts with restrictive safety codes instead of following more lax federal guidelines. At least one school district is already working to get its employees on board with SB 725. 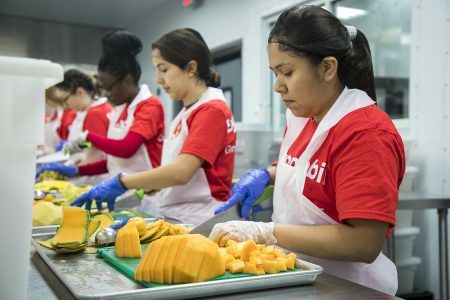 San Antonio ISD administrators have already found 13 teachers and counselors willing to serve as liaisons to start food pantries in their schools. With 25 percent of students in the county at risk of going hungry, officials are eagerly seeking solutions that might get more food into their hands, said Jenny Arredondo, the district’s child nutrition services executive director. 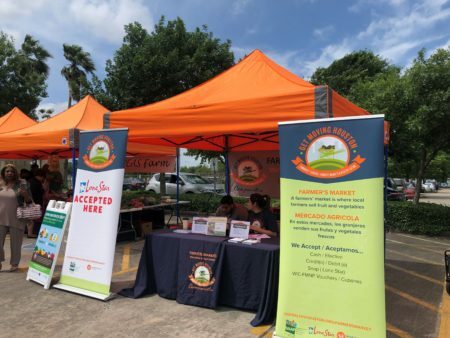 This month, Arredondo will distribute a start-up packet with information about what items could be donated to or stored in a pantry due to food safety regulations. “We’re assisting campuses with designating a spot on the campus that we are claiming is safe. When you store food, it’s not like storing books or boxes,” she said. Many schools have already piloted other programs to keep uneaten food in the hands of students. Though federal law is permissive, Texas school districts are subject to more constricted local health laws that determine what they can do with the unopened milk cartons and unpeeled oranges that end up filling the trash cans after each meal. The U.S. Department of Agriculture released a memo in 2016 encouraging the use of share tables, which let students leave food they don’t want on a table where other students can pick it up. Estrada said she was the first cafeteria manager in El Paso ISD to try it out last spring, after officials cleared it with the local health department. Most of the food waste comes not from the kitchen, but from students who don’t finish the meals they take. Last year, the district’s new policy allowed students who no longer had money on their meal cards and who had exhausted their credit to pick from the unopened, packaged items on the share table. “Instead of them getting a cheese sandwich, we tell them, ‘Come on, let’s see what’s there for you to take,'” Estrada said. SB 725 also requires school districts to make arrangements to pay off the meal debt of students who need a payment grace period, and it prevents them from shaming those students by publicly identifying them.